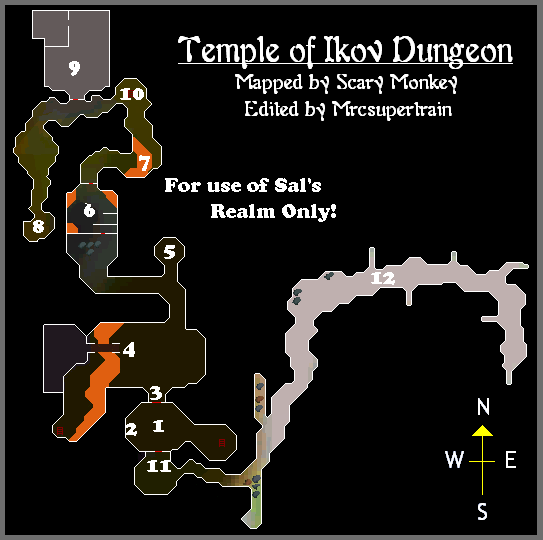 The Temple of Ikov is mainly used in the Temple of Ikov Quest. 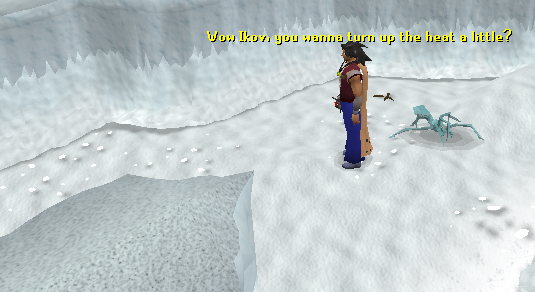 In here, you'll find boots of lightness, ice spiders, lava rivers, the legendary staff of Armadyl, and lots more! 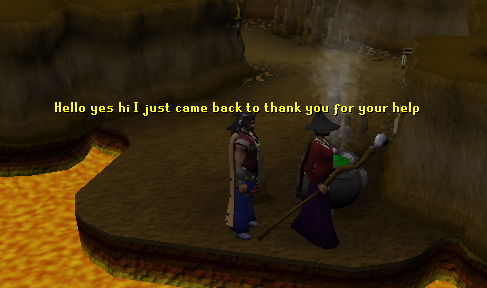 Before you can go very far in the dungeon at all, you will need to start the quest by talking to Lucien in the Flying Horse Inn in East Ardougne and he will give you a Pendant of Lucien. Method 1 - Teleporting There are a few options if you choose to use teleportation. If you have done the Plague City quest and have 51 Magic, you can teleport to Ardougne's town square and follow the path north out of the city. 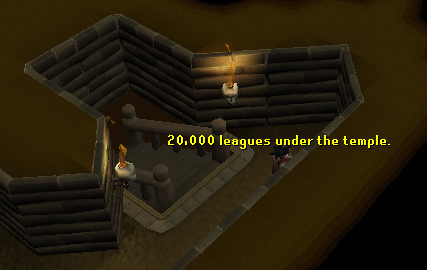 This requires 2 law and 2 water runes, or an Ardougne teleport tablet. At 45 Magic, you can teleport to Camelot with 1 law, 5 air runes, or a Camelot teleport tablet. From there, follow the path southwest. 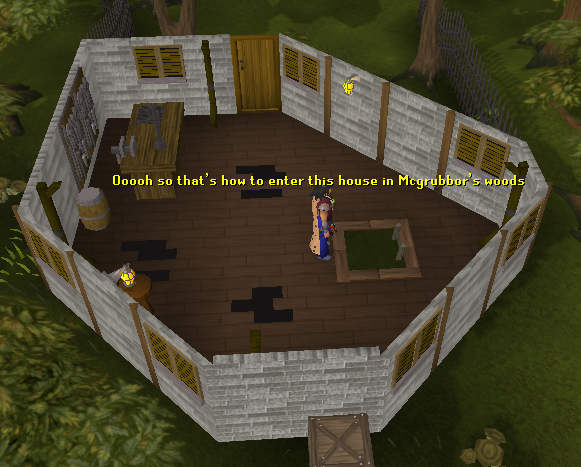 If you'd rather not use any runes, or don't have the required levels but have the Ardougne lodestone unlocked, use the Home teleport to arrive at Ardougne. Follow the path northeast from the north gate of the city. Method 2 - Jewelry There are two different options for this: A Skill's Necklace or a Combat Bracelet. They are both enchanted from Dragonstone jewelry with level 68 Magic or brought from other players or the Grand Exchange. The Skill's Necklace offers a teleport to the Fishing Guild, and the Combat Bracelet can teleport you to the Ranging Guild. The Ranging Guild is closer, so it is recommended to use the Combat Bracelet if you can. 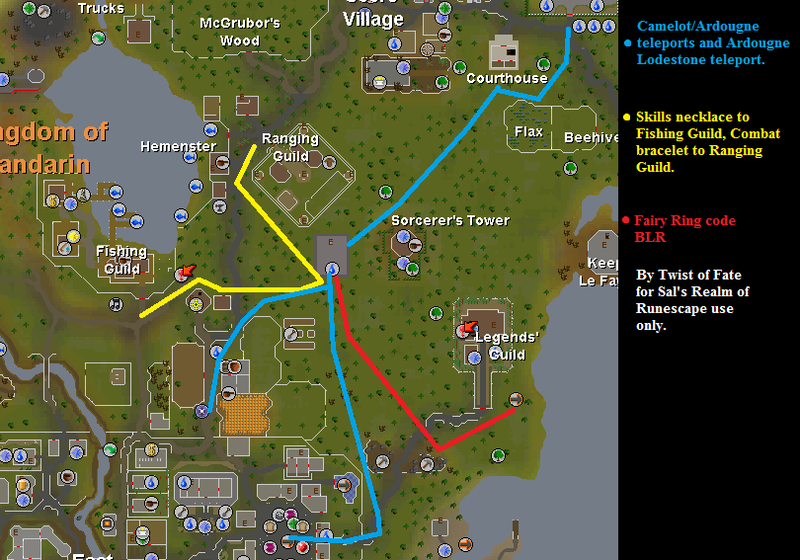 Method 3 - Fairy Ring If you've gotten far enough in the Fairy Tale Part II: Cure a Queen quest, you can access the Fairy Ring network and use code BLR to teleport just east of the Legend's Guild. From there, follow the red path west of the guild and north. 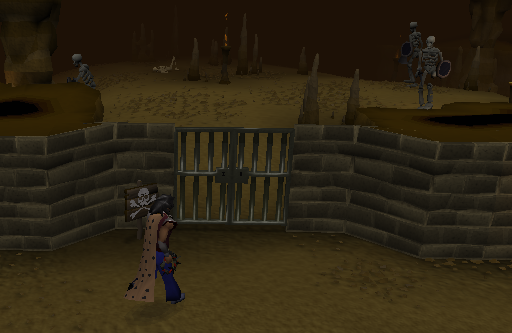 After you come down the ladder into the dungeon, you'll be in this scary place with a bunch of level 64 Giant Bats and you'll be wondering where you are and where these two gates go. All this will get explained throughout the guide. (2) Down Some Stairs We Go! Just a little bit west from the center of the dungeon (point 1 on the map), you will see some stairs. To go down these stairs, you will need a lit candle, a lit lantern, or any type of light source. In case of emergencies, your toolbelt has a tinderbox. Down here you will find a pair of Boots of Lightness, which will decrease your weight by 4kg when worn. You need a sharp weapon to slash through the spider web to get to the Boots of Lightness, or just use the knife in your toolbelt in case you didn't bring anything. There's also a level 4 Giant Spider and a Knife outside the chamber of the Boots of Lightness. There's also a Giant Spider and a Knife next to the Boots of Lightness. Try to go through the north gate, what happens? Some kind of force will push you back! To get past, you need to be wearing a Pendant of Lucien. You get this at the beginning of the quest Temple of Ikov. Lucien can be found in the Flying Horse Inn in East Ardougne. Go north-west and you will see an old bridge. This is where the Boots of Lightness come in - equip them to decrease your weight by 4kg, and cross the bridge. Warning: Warning: If you weigh more than 0kg after you put the boots on, you will fall into the lava and get hurt for 200 damage! Ouch! 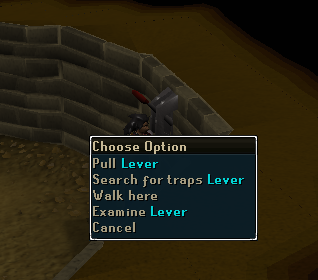 If you fall in, you'll need to go up the ladder to the west and try again, after banking your items. After you cross the bridge, open the door and go inside of the room. Take the lever in the southwest corner and then cross over the bridge again. Head back to the ladder and use the lever on the lever bracket just south of the ladder, then pull it, and this will open the south ladder - point 4 on the map. Tip: If you don't want to have to go all the way back to bank, make sure nobody's around, drop all your items, run across the bridge, pick up the lever and then run back, and then run back and pick up everything you dropped. After going north of the bridge you'll come to a place where you can either go north or west. Go west and you will come to a door. The door is locked and to unlock it, you need to go back and go north instead. If you have already completed the quest you will not need to pull the lever and you can just continue west. After you go through the west gate, you will come into a room with lots of blood on the walls, level 84 skeletons, corpses, bubbling lava everywhere! If you go north from here and go through the door and then walk a little bit west, you'll see an old witch called Winelda and a river of lava. She will teleport you across the river of lava, but for a price. If you haven't done the quest you'll need to pay a price of 20 limpwurt roots and she'll teleport you. After you pay once, every time you come back ask her to do the honors again and she'll teleport you quickly and easily. There are a few level 84 Skeletons around. After you get teleported by Winelda, go north, then west, and then south. 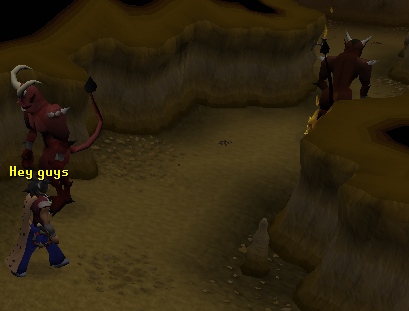 There are a couple of lesser demons (level 100) and a Shiny Key on the ground. 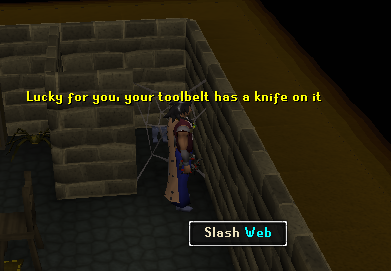 Pick up the shiny key if you plan on going into the Armadyl Hideout. It's pretty easy to find, you just need to walk a little north-west of where Winelda teleported you. Lower levels should watch out for the skeletons. You need to push a secret wall in order to get in. Once you're in, you'll see lots of tables and chairs, as well as a few Guardians of Armadyl (level 60). In the north-west corner you will find the Staff of Armadyl. Before you can take it you need to make sure their's nobody around. If someone sees you, fight it and then take the staff. 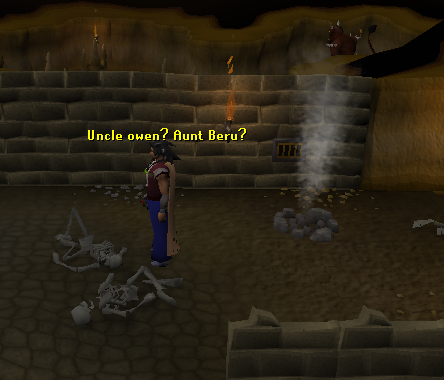 To get out of this big scary dungeon, there is a ladder just south-east of point 7, the Armadyl Hideout. It will take you to a small house just north of McGrubor's wood - which in case you didn't know, is north-west of Seers' Village. After you walk out of the little house the door will lock so you won't be able to go back. After you have pulled the lever, go a little bit south from point one on the map, you will see a gate. Go through this gate, east and then north and it will be all icy everywhere, with quite a lot of ice spiders (level 60). These do quite a lot of damage, so it would be useful to bring food! You will also notice lots of chests. Travel a bit east through this tunnel of ice, and you will notice lots of chests. 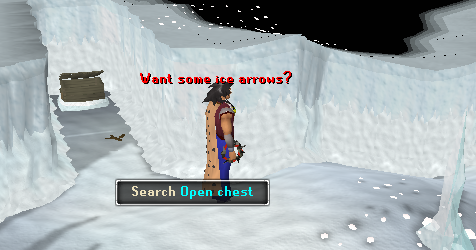 These are used during the Temple of Ikov quests to find Ice Arrows. There is only one chest with ice arrows in it and when you search it and you get the arrows, the chest with the arrows in it will change.